Is a new bypass for the A27 the only option? Two political groups have called for called for other options to be looked into for the A27 to tackle congestion and air pollution. In separate statements, Chichester Labour and Chichester and Bognor Green Party said steps should be made to promote alternative means of transport with suggestions including a metro system along the south coast. Chichester and Bognor Green Party said it was renewing a plea for 'serious alternatives' to new road building while Chichester Labour announced plans to launch a consortium to lobby for the 'transformation of regional rail'. City councillor Sarah Sharp (Green) said: “The IPCC tells us quite clearly need ‘urgent and unprecedented’ changes to the way we travel. "Hopefully people will be aware that the United Nations has haven us 12 years to act to avoid catastrophic climate events – the UK Committee for Climate Change agrees that we are falling behind on our carbon reductions and yet the A27 debate rages on oblivious to the bigger picture. “The local plan puts the unpopular and insensitive Stockbridge Relief Road back on the agenda, as well as the rejected right-hand turns. Phil Wilson, Chichester Labour's spokesman for transport said: "A consortium of interested parties, local authorities and business leaders would the first step towards gaining central government support to transform regional rail and create the truly integrated public transport network that we desperately need in Chichester and along the south coast. "With yet another delay to a decision on the future of the A27, the alleviation of traffic as well as the reduction in pollution by creating vastly improved public transport network should be a key priority, especially with the proposed local plan which seeks to build and additional 10,000 homes in the district. "Considering rail upgrades and improvements such as Thameslink and Crossrail, it is time that these benefits trickled down to us on the South Coast. "But if we are going to benefit, we need a Labour council to fight for that investment and to fight for our corner of the world that has been so utterly failed by the Tories. Only Labour has the local and national vision to create the jobs and infrastructure required for the 21st century." 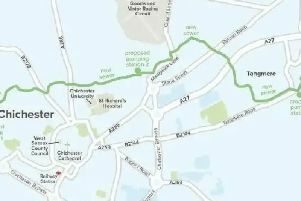 Members of the Chichester and Bognor Green Party also called for a ‘serious alternative’ to new road building after Highways England decided not to take up a Northern of Southern route for the A27. The group said sticking to a system where people can only travel effectively by car is an ‘own goal’ and said it would add to problems caused by vehicles such as air pollution and climate change.